This incredible shield traces back to the end of 8th to mid 11th century, known as the Viking Age. It features wood construction with a ringed metal brace, a burnished black boss adorned with Y-shaped etched plates, and black and white quartered field with emblazoned stylized dragons. 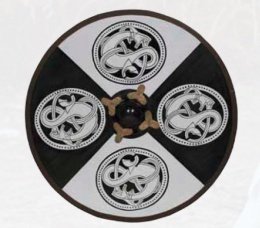 The smaller shield sizes came from the pagan period for the Saxons, The late-9th-century skaldic poem, Ragnarsdrapa, describes some shields painted with mythological scenes.